Read this eBook and learn how to use the Martingale system for the game of Roulette. In this eBook you will also discover the advantages and disadvantages of using this straightforward roulette system. The sections available in the eBook are as follows: Introducing the Martingale system, Employing the Martingale system and Recommended Resources. 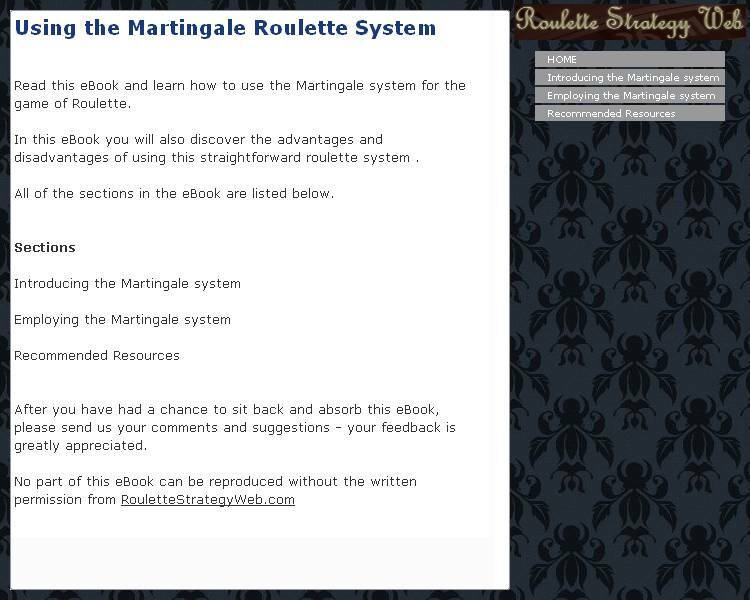 Read this eBook and learn how to use the Martingale system for Roulette. ...... It was originally a term used in reference to a group of strategies for betting that were very popular at the time. The main games these strategies were initially developed for were the ones that involved winning for heads up and losing for tails up when playing with coins. The basics of the martingale system revolve around the goal of making a profit in the long run. Basically, the person makes a double bet after a loss. The main purpose of this is to gain back what was lost in the previous round. In roulette the best types of bets to use with the Martingale roulette system are outside bets such as red or black, odd or even and the high or low bet. There are two very simple requirements for the Martingale roulette system to work. One of the requirements is a large wealth source. With enough resources, it is possible to continuously play round after round until the probability of hitting the bet comes around. RouletteRaid software is unique in that it runs five systems! How to win at Roulette! You have found the planet's perfect Roulette Software! Island Roulette immerses you to the mysterious underwater world! Qweas is providing links to Using the Martingale Roulette System 1.000 as a courtesy, and makes no representations regarding Using the Martingale Roulette System or any other applications or any information related thereto. Any questions, complaints or claims regarding this application Using the Martingale Roulette System 1.000 must be directed to the appropriate software vendor. You may click the publisher link of Using the Martingale Roulette System on the top of this page to get more details about the vendor.